From what we gather, sleep is pretty precious for new parents. So a smart crib - or cots for you Brits - could be damn appealing if you can get over the proximity of baby to electronics. 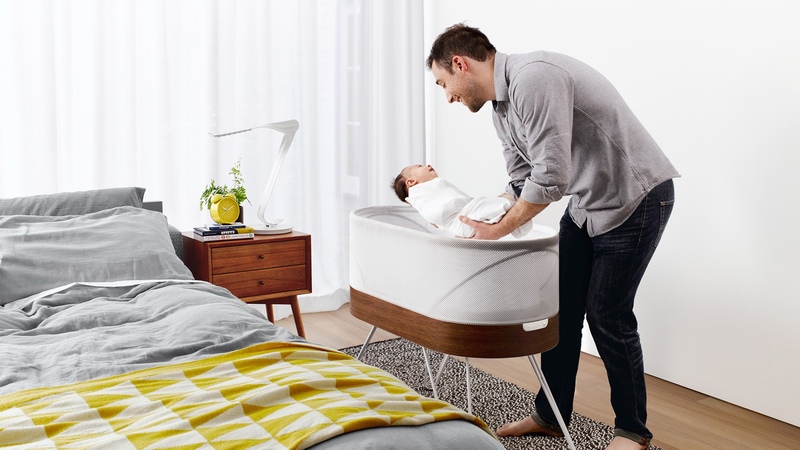 The Snoo smart crib from California startup Happiest Baby is a collaboration with Yves Béhar (of Jawbone, Hive, XO fame) and his Fuseproject studio and has taken five years to design. It is aimed at babies from newborns to six months old and has a super stylish wood base and white textile mesh sides so you can see in. Here's how the smart bit works. Microphones and sensors embedded in the robotic crib detect when a baby is crying or moving (so, definitely awake). Then the Snoo will begin to rock - parents can preset the exact speeds - to get the baby back to sleep. For safety, it will only rock if the baby is secured in a cotton swaddle. In fact the whole set up is supposed to replicate the womb. There's also a speaker so you can experiment with whether white noise helps too. The whole thing does run over Wi-Fi but worried parents will be glad to know there's even a Wi-Fi shield between the baby and the radio module. Plus, the Wi-Fi can be switched on and off. The companion app for parents lets them monitor sleeping patterns and such but the real benefit here is not having to get up and rock the cradle every time your baby wakes up. The founder of Happiest Baby is actually a paediatrician Harvey Karp who has written a book on how to calm crying babies. The price is steep at $1,160 - hey, if this isn't a premium digital parenting product then what is? And can you put a price on sleep?